There are a large number of types and models of color inkjet printers. 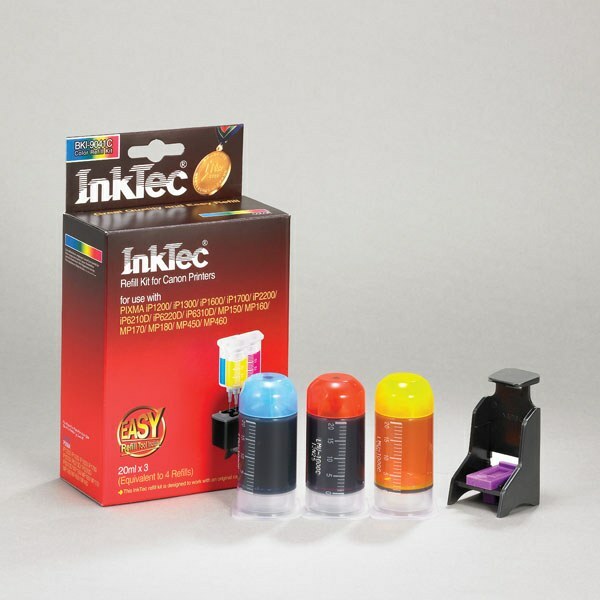 At low private cost of these devices, their operation is quite costly, because the cost of consumables, in particular the original ink, very high. You can reduce printing costs, tucking the printer cartridges and cheaper non-original ink. It is necessary to remember only that this dressing may lead to malfunction of the printer, and you do it at your own risk. Also a good alternative to original cartridges is installed in the printer CISS (continuous ink supply system). kit cartridge refills (depending on the printer model, its configuration may be different). On the Canon printers, usually installed 2 cartridges – one for black ink, one for color printing. Determine what color of ink used in your printer model. Remove the black cartridge. Seal with tape the nozzle at the bottom of the cartridge. Tear off the sticker at the top of the cartridge. Fill the syringe with 10 milliliters of black ink. Slowly insert the needle of the syringe into the hole in the top of the cartridge 5 mm. Slowly moving the piston of the syringe, inject ink into the cartridge. Glue into place the sticker at the top of the cartridge. Remove the tape from the cartridge nozzle. Install the cartridge into the print carriage. Remove the color printer cartridge. Immediately seal the nozzle at the bottom of the cartridge. Peel off the sticker from the upper side. Below it will be 3 holes, each leading to a container of a certain color. Important! Correctly determine what color ink is in each tank. Otherwise wrong colors after refilling the cartridge unusable. To determine the color of ink in each tank, insert into the holes easily painted any thin hard object. It can be sharpened matchstick, wooden toothpick, and the like. Fill the syringe with 5 milliliters of ink. Then insert the needle of the syringe into the cartridge hole of 5 mm. Slowly inject ink into the cartridge. Repeat this step with the two remaining containers in the cartridge. Seal the top hole on the cartridge is an old sticker or tape. Peel off the tape from the cartridge nozzle. Install the cartridge into the print carriage. Turn on the printer. Press and hold "Stop/Reset". After 30 seconds, turn off the printer ink counter and then they can use. This method of resetting doesn't work for all printer models. In this case, use the special software to reset the ink.